This post contains affiliate links – which means I may receive a small commission. For more information, see the FAQ. 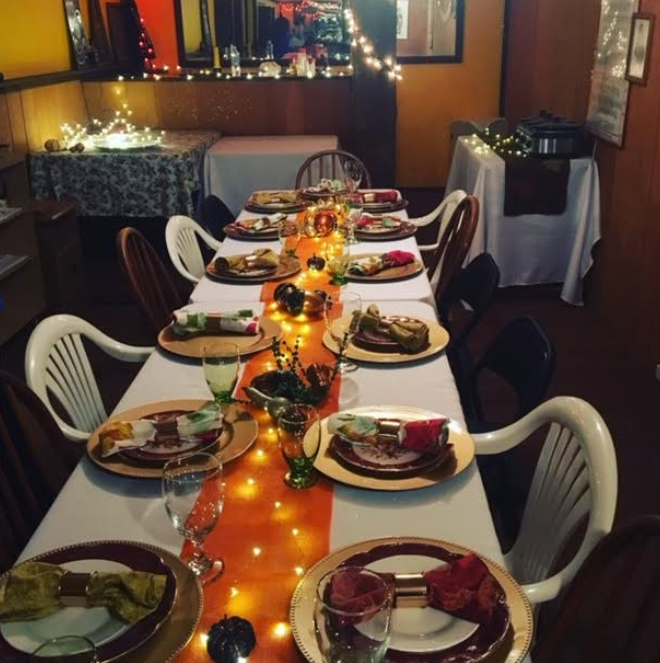 Tablescapes are a festive (and easy!) way to decorate for your holiday dinners. The best part? You can do anything! You can make a showstopping centerpiece or create a simple and elegant ambiance to create a cozy environment for your dining guests. For our crisp, autumn days ahead – I wanted to create a cozy environment that brought in the colors, warmth, and feel of the harvest. Bringing in natural tones with gold accents. 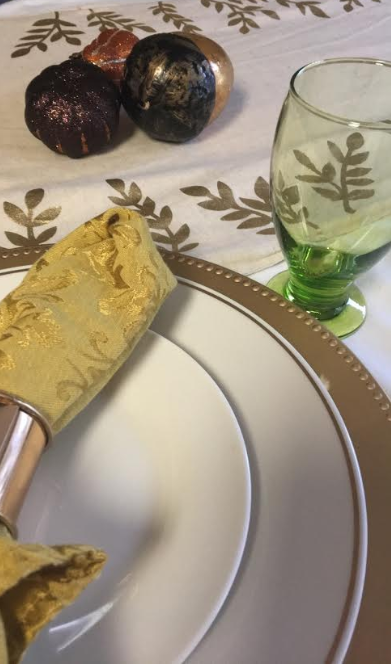 For the entire table decor, I spent less than $40 at Target and… wait for it… the dollar store. My rule is to always (or at least always try) to buy items that I can reuse for a multitude of occasions. Start with a base, for this I utilized a white table cloth. This was a Target purchase, and was only $14.99. Chargers can get REALLY expensive. I’ve found them upwards of $4.99 for one at craft stores. Go to your local dollar store, and you can find these great chargers (the same as the big box stores), for $1 a piece. The green glasses came from the dollar store too! 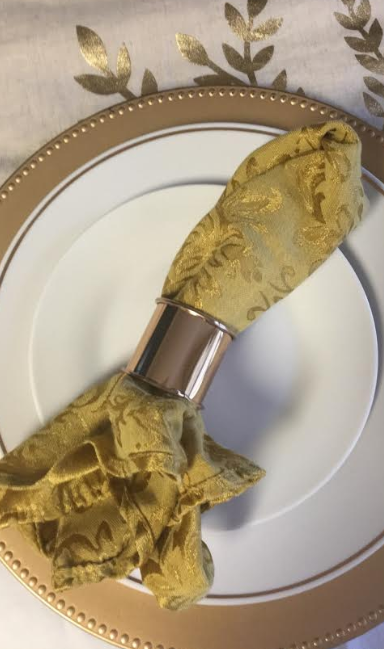 Cloth napkins add a little extra to your dinner. 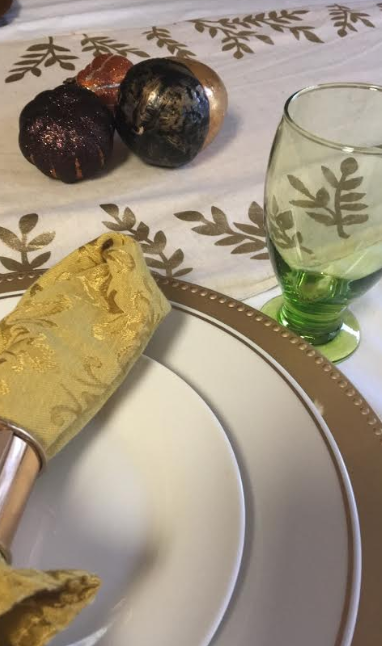 I agree that they’re not practical for everyday use, but absolutely make the dinner feel a bit more boujee, but hey, why not? 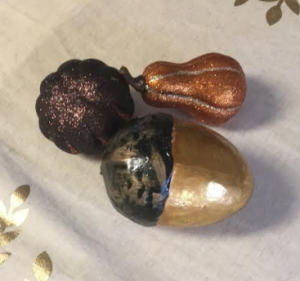 For the harvest, I added faux glitter gourds which can be purchased at any craft store. 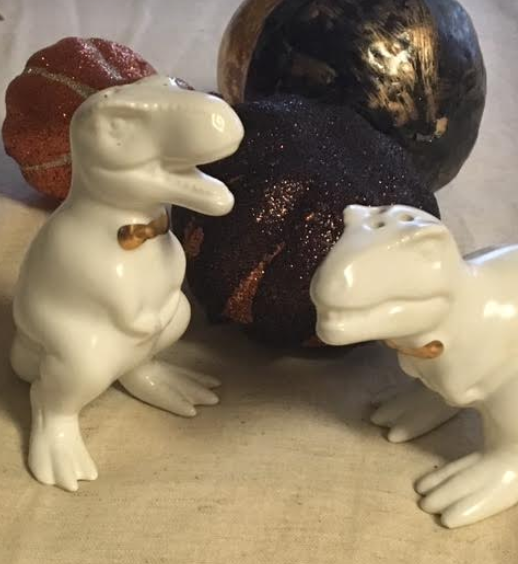 Salt and pepper shakers can add a little bit of fun to your table. For this table, a t-rex in a bow tie wins. Here’s a photo of the pull tablescape utilized for Thanksgiving a few years back. I used my inherited fine china and dollar store plates. Please excuse the lawn furniture – it was a large crowd.